Salvatore Ferragamo celebrates chic young women creating a unique style signature of timeless modernity, creativity and a hint of audacity. A girl playing with her different characters: sophisticated and cheeky, like Signorina Eau de Parfum, elegant and seductive like Signorina Eleganza and unpredictably mysterious like Signorina Misteriosa because Signorina is a different Signorina every day. 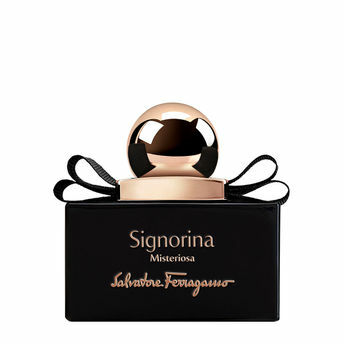 Signorina Misteriosa is the celebration of a chic girls' mysterious side. It is a daring , sophisticated fragrance opening with fresh and bitter flavors of wild Blackberries and Neroli. Orange blossom and sensual Tuberose contribute to the oriental - fruity character of the scent. Patchouli gives a sophisticated touch, while Black Vanilla mousse marks the base. Makes it a perfect evening fragrance. Explore the entire range of Perfumes (EDT & EDP) available on Nykaa. Shop more Salvatore Ferragamo products here.You can browse through the complete world of Salvatore Ferragamo Perfumes (EDT & EDP) .Alternatively, you can also find many more products from the Salvatore Ferragamo Signorina Misteriosa Eau De Parfum range.